The Rogue Tomato is a modern American eatery from Glendale Arizona. The locale’s eclectic setting, amazing Southwestern food selection and live music make eating a truly great experience. The restaurant hired us to help them create an online presence that will emphasize the experience of visiting in person. The online experience we designed for The Rogue Tomato reflects the experience that the chefs wanted their customers to enjoy while dining. We wanted to give users a sense of what the restaurant is about before walking in by using similar color patterns and wide imagery of the interior, with content being juxtaposed or overlaid throughout. A critical component of the website was the design and implementation of a menu management system. 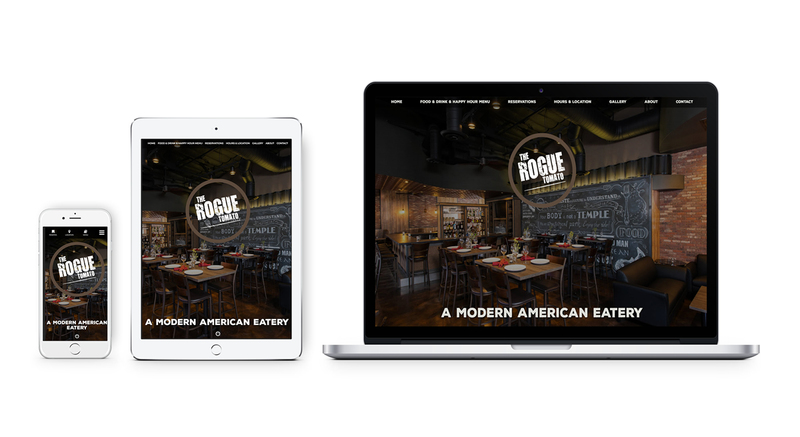 We took The Rogue Tomato’s full menu and redesigned it for easy online access while building an easy-to-maintain backend set of functionalities to aid staff at the restaurant to edit menu items and prices. We were glad to collaborate with The Rogue Tomato on a series of print advertising items that helped them increase business exposure and increase restaurant traffic. Online restaurant experiences require tremendous attention to detail to create engaging user experiences that drive users to book a reservation. Making sure that the physical and digital experiences are intertwined is what makes this restaurant website design project a success.